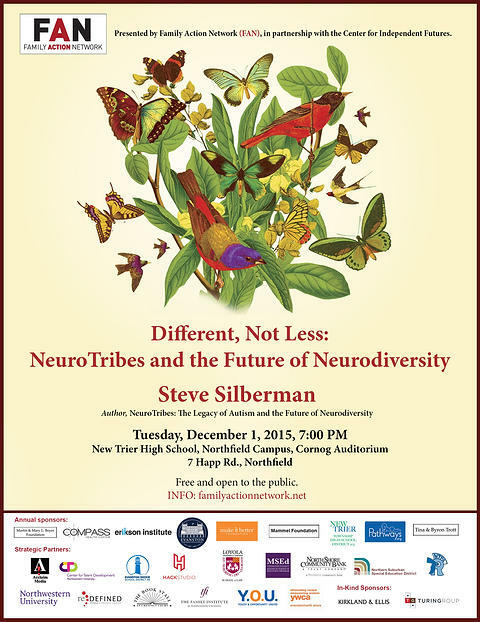 Family Action Network presents Steve Silberman, Different, Not Less: NeuroTribes and The Future of Neurodiversity. In this lecture, Steve Silberman, the award-winning science writer whose articles have appeared in Wired, the New Yorker, the MIT Technology Review, Nature, Salon, Shambala Sun, and many other publications discusses neurodiversity, the growing movement to frame autism and other conditions such as dyslexia, dyspraxia and ADHD as natural human variations in the human genome rather than disorders. Silberman advocates that neurological differences are authentic forms of human diversity and that often, atypical forms of brain wiring also convey unusual skills and aptitudes. He argues that society should honor and nurture neurodiversity and help individuals make the most of their native strengths and special interests, rather than focusing on trying to correct their deficits or normalize their behavior. Silberman’s groundbreaking 2015 book NeuroTribes is a compassionate and comprehensive history of the science and culture of autism. NeuroTribes unearths the secret history of autism, while also discovering surprising answers to the crucial question of why the number of diagnoses has soared in recent years. Silberman’s in-depth feature writing on topics such as autism in high-tech communities, the placebo effect in clinical trials, the war on amateur chemistry, and the mind of the late neurologist Oliver Sacks (who wrote the foreword for NeuroTribes) may have brought him a great deal of notoriety and Twitter followers, but it is his nuanced, empathetic approach to the subject of autism and neurodiversity that has gained him respect and gratitude from the communities he profiles. Free and open to the public — no tickets required.